Finasteride 1mg is the active product in Propecia which was the drug’s first ever brand name, however, due to its exclusive license expiring in October 2014, various other generic and alternative finasteride brands are now available. Over 20 years ago a drug by the name of Proscar was approved for prevention of Benign Prostate Hyperplasia (BPH). Its active ingredient was 5mg of Finasteride, and it was taken once daily by men over 60. Finasteride was shown to inhibit the formation of the hormone Dihydrotestosterone (DHT), which is known to help in the formation of Prostate Cancer. Dihydrotestosterone is also known to be the cause of male hair loss. Merck Pharmaceuticals sought to find the smallest effective quantity of finasteride and test its long-term effects on 1,553 men between ages 18 and 41 with mild to moderate thinning hair. Based on their research, 1mg daily was selected, and after 2 years of daily treatment, over 83% of the 1,553 men experiencing male hair loss had actually maintained or increased their hair count from baseline. Visual assessments concluded that over 80% had improved appearances. According to an assessment of photographs by an independent panel of dermatologists, in a 5-year clinical study of 279 men, 9 of 10 achieved visible results: 48% experienced hair regrowth and 42% stopped losing their hair. Nearly 70% of men who took Propecia regrew hair, as measured by hair count. All of the men in the study who were not taking Propecia lost hair. 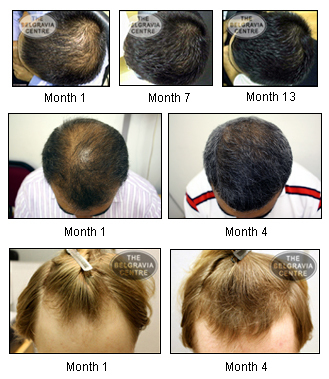 Click on the image above to view the largest gallery of hair growth success stories in the world. Who is Propecia Suitable For? Propecia is only approved for use in Men over the age of 18. Refer to the male hair loss section for information on the causes of Male Pattern Hair Loss, this may help you understand Propecia’s methods of action more clearly. When taken, Propecia works to inhibit the formation of DHT (the product that causes genetic hair loss) within the system. Within a few months of using Propecia the overall DHT levels will have remained low enough on a constant basis that the adverse effects DHT is having on the follicles will stop, resulting in a cessation of hair loss. Propecia contains 1mg of Finasteride, a systemic DHT inhibitor which has been used for over 20 years at five times the dosage (in the form of Proscar) to help treat men with Benign Prostate Hyperplasia (BPH). Please view the official PATIENT INFORMATION LEAFLET (PIL) for information on possible adverse effects of Propecia. This is the leaflet provided with the medication. Propecia is an effective medication fo hair loss but for those who do not wish to use it, there are a number of Propecia Alternatives. Propecia should be administered in a 1mg per day dose, in pill form, with no exceptions.